Captain Mark Wisberger says that the F-18 that crashed was on a training flight, and shortly after takeoff the plane suffered "catastrophic mechanical malfunction." 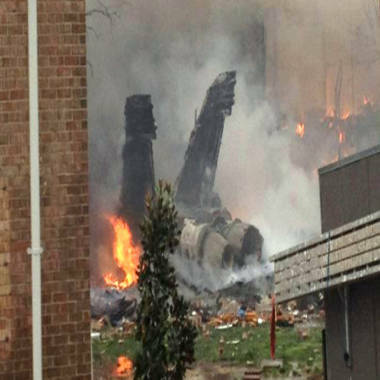 A military jet burns shortly after crashing into an apartment complex in Virginia Beach, Va., on Friday around noon. The aircraft went down in the sprawling resort town shortly after it took off, the Navy said. Updated at 9:45 p.m. ET: Emergency crews extinguished fires and were combing rubble at a cluster of apartments in Virginia Beach, Va., Friday after a Navy F/A-18 jet crashed into the complex, destroying two buildings and damaging several others, authorities and witnesses said. Seven people, including the two pilots, were taken to a hospital, officials said. By Friday evening, all the injured except one pilot were treated and released, officials said. None of the injuries were life threatening and no fatalities were reported. Firefighters at the complex had not been able to get in touch with three residents, who are being classified as "unaccounted for," however they were not being considered "missing," NBC News reported on Friday evening. The crash was caused by a "catastrophic mechanical malfunction" that forced the two pilots to eject, Capt. Mark Weisgerber, deputy commodore of Strike Fighter Wing Atlantic, said at a news conference. He said the pilots were a student and an experienced instructor. He said he didn't want to speculate on the specifics of the malfunction. One pilot was briefly tangled at the crash site and had to be freed from the wreckage by residents, David Schleck, assistant city editor at the Virginia Pilot, told msnbc cable television. "(The pilot) was snagged on the burning building," said Schleck. "They actually cut him free from the building and then emergency crews showed up a little bit later and were able to get him a safe distance from the burning building." A Navy official told NBC News that both pilots were taken to a hospital to be checked out. "They were ambulatory," the official told NBC. The buildings were in the Mayfair Mews Apartments, about four miles northeast of the Naval Air Station Oceana, where the jet had taken off. Virginia Beach, about 400 miles south of Washington, D.C., on the Atlantic coast, is a major military center as well as vacation destination. Cmdr. Phil Rosi of the Navy said the two-seat jet fighter crashed about 12:05 p.m. shortly after takeoff. The jet was assigned to Strike Fighter Squadron 106 at the base, he said. Witness accounts of the jet dumping fuel before the crash suggest that the pilots had averted a worse disaster, according to Bruce Nedelka, the Virginia Beach EMS division chief, who spoke to The Associated Press. Capt. Mark Wisberger says the F-18 that crashed was on a training flight when it suffered "catastrophic mechanical malfunction" shortly after takeoff. "By doing so, he mitigated what could have been an absolute massive, massive fireball and fire," Nedelka said. "With all of that jet fuel dumped, it was much less than what it could have been," he said. The Navy's Weisgerber said it wasn't clear whether the dump was intentional or a result of the jet's malfunction. Emergency officials said some 40 apartments were damaged or destroyed in the crash. Witnesses described a frightening scene as they saw the aircraft plummet toward the ground. John Swain told msnbc TV he was driving, coming off Interstate 264 to head north. "The plane came right over us and was clearly in difficulty," he said. "There was flames coming off the back. … The plane got lower and lower and just as I turned … it crashed." He said the jet apparently crashed into what looked like a two-story apartment building. "Within five seconds of it going down I was at the building where it hit," Swain said. Ernie Gonzalez, who is retired military, was sitting on the front porch of his daughter-in-law’s house behind the base where the jet had taken off. He said a few other jets had departed before the one that crashed for what was believed to be a practice or training run. The doomed jet quickly ran into trouble. "He was flying real low like he didn’t have any power,” Gonzalez told msnbc.com by telephone. "He was smoking really bad. Bad smoke was coming out of the engine. It kind of backfired a couple times. I heard two pops … then 15 seconds later I heard the explosion." Gonzalez said the other jets then started circling around the crash site. Amy Miller told The Virginian-Pilot she was outside the cleaners where she works when she saw a plane coming down with fire on its wing. About two seconds later it crashed, she said. "It looked like it had either hit the building or slid into it. Part of the building had crumpled up," she said, according to the Virginian-Pilot. Austin Makie, of Virginia Beach, said he was golfing with two friends on a course a few miles away from where the jet went down. He said they were riding in a cart headed to the next hole when they heard a loud boom. "We looked around … and there was a very large pile of smoke. There was really big stench like gas in the air," he told msnbc.com. State and local police were on the scene to assist the military, according to Grazia Moyers, spokeswoman for the Virginia Beach Police Department. The Virginia-Pilot reported that a shelter had been opened to accommodate people displaced by the crash. "We are taking all possible steps at the state level to provide immediate resources and assistance to those impacted by the crash," said Virginia Gov. Bob McDonnell. "I deeply regret that some in our community have lost their homes, and I, like many, pray for the well-being of all," said Adm. John C. Harvey, Jr., commander of U.S. Fleet Forces, in a statement on the crash. "I must also offer my deepest gratitude to the citizens of Virginia Beach and the Mayfair Mews Apartments, as well as Virginia Beach's first responders, for their immediate and heroic response to take care of our aircrew after they ejected and all at the scene of the mishap." Harvey promised a prompt investigation. Mississippi on way to becoming 'abortion-free' state? Trayvon Martin: Where do we go from here?